I seriously can’t stand not being able to find the right size lid when I’m putting away leftovers or doing meal prep. 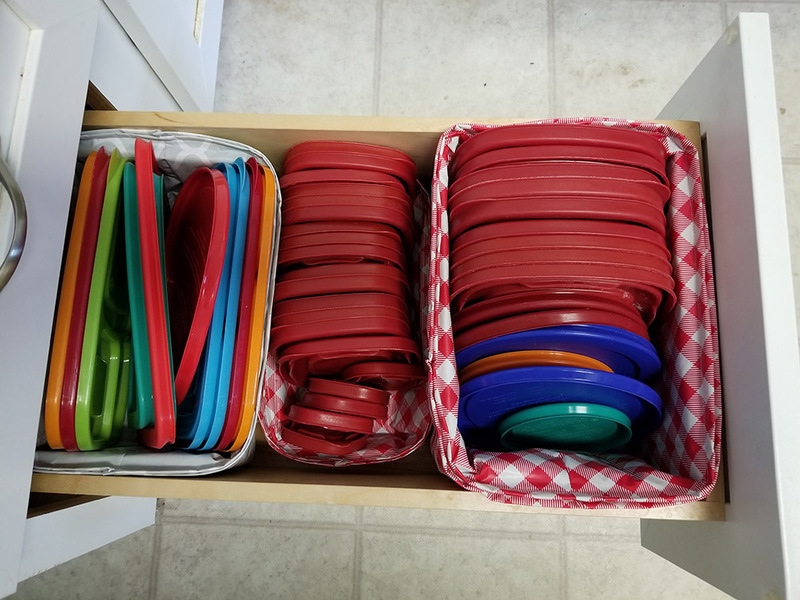 Finally, I was so tired of my lid drawer that I finally decided to do something about it and made kitchen lid organizer baskets. It may not look super crazy now, but I threw away six miscellaneous lids that didn’t have containers to match! And I had three lids that went with Cool Whip bowls or butter bowls. Learned that trick from my mom. But my mom had bought us a microwave save bowl set several years ago and we received an awesome Pyrex dish set for our wedding. So, even after throwing away miscellaneous lids it was still super bugging me! 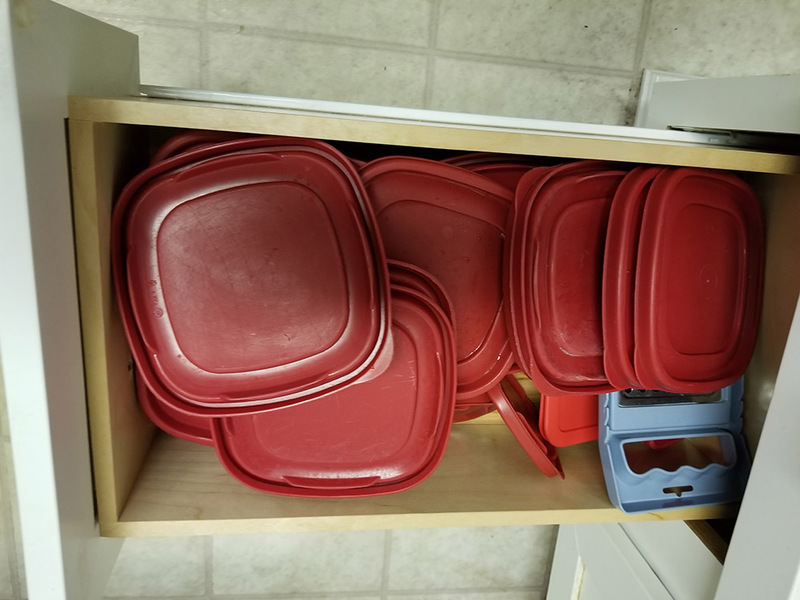 First thing I did was Google search kitchen organization. I came across this blog post about silverware baskets for Christmas. It was the perfect idea for holding lids in the drawer! I had a couple remnants of laminated fabric that I’d been holding onto for awhile with no idea what to do with them, yet. They were less than $3 each at half a yard. I did have some plastic grids to use for the sides, but not enough and I was too lazy to head to the start to buy more. So, I used the cardboard from my polyfil that I had just emptied. I couldn’t measure all the way to the edges or seam allowances as the cardboard was a little too thick and my needle lifted off the fabric. The only problem was I don’t math and I needed to change the measurement sizes. It took me four tries with junk fabric from the mother-in-law before using my real fabric. The main basket measured 17 x 19 when flat for a 10 x 7.5 basket. The small lid basket was just big enough with my leftover fabric at 13 x 9 for a 10 x 2.5 basket. The final basket laid out at 13 x 19 for a 10 x 5 basket. I goofed on the last two baskets due to their narrower measurements from the first basket. Now we have simple organization even the hubs can appreciate!